- Began with vol. 1, no. 1 (Dec. 1942) and ceased with vol. 1, no. 3 (June 1943). 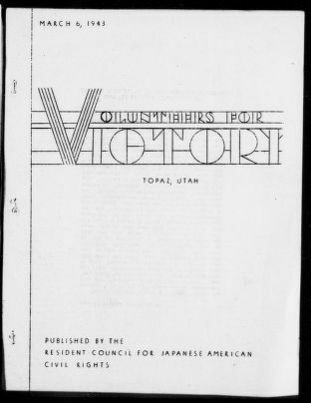 - Issue for Dec. 1942 published by the Central Utah Relocation Project. - Description based on: Vol. 1, no. 2 (Feb. 1943); title from cover. - Latest issue consulted: Vol. 1, no. 3 (June 1943). Trek . [Topaz, Utah, March 6] (Topaz, UT), Mar. 6 1943. https://0-www.loc.gov.oasys.lib.oxy.edu/item/2008257345/1943-03-06/ed-1/. (1943, March 6) Trek . [Topaz, Utah, March 6]. Retrieved from the Library of Congress, https://0-www.loc.gov.oasys.lib.oxy.edu/item/2008257345/1943-03-06/ed-1/. Trek . [Topaz, Utah, March 6] (Topaz, UT) 6 Mar. 1943. Retrieved from the Library of Congress, www.loc.gov/item/2008257345/1943-03-06/ed-1/.